Happy 2014! hope this will be a healthy and happy New Year for you all. 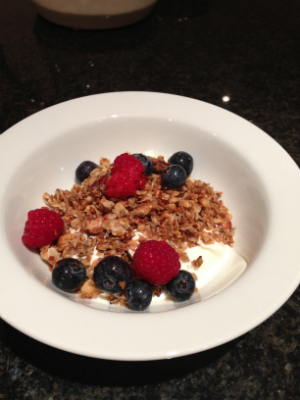 Thought I would have a go at a no sugar Granola recipe for a healthy breakfast choice for the New Year, hopefully you will like it too. 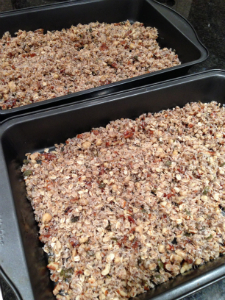 Use food processor for nuts, don’t make them to fine better left coarse. Melt coconut oil, use a glass jug to put the coconut oil in and stand in saucepan of boiling water. 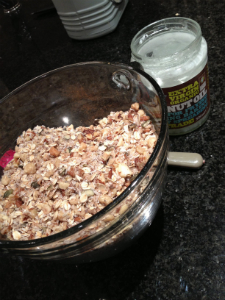 pour melted oil into nuts etc stir well. bake in hot oven 180c for 9 mins stir then back in the oven for a further 9 mins until becoming a lovely golden brown. serve with fresh berries and plain full fat greek yoghurt, best to avoid dried fruits as they are higher in sugar. sometimes I use double cream and use as a healthy pudding.